This book shows you how to create architectural drawings and 3D models one step at a time. 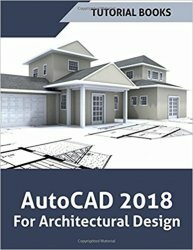 Brief explanation and step-by-step instructions make this book a perfect way to get started with Architectural Design using AutoCAD. In addition, you can download the working files for chapter from the website, and use them for any help. Author first introduces the AutoCAD interface, and then moves directly into Architectural drawings. You will learn to draw walls, doors and openings, windows, stairs, and elevations. Later, you will use the 2D drawings to create a 3D model.